Rooted in the genius loci of Moscow and the site, the Zaryadye Park is designed as an urban ecosystem that provides multiple eco-services to the city and people. By overlaying the richness of site’s historical layers, the Park becomes a living puzzle that locks together the city’s memory, culture, ecology and people, which reveals the memory of the past and makes a prophecy for the future. Zaryadye Park is a contemporary landscape with a new aesthetic based on environmental ethics: it offers high performance and requires low maintenance; it repairs the broken connections between man and nature. Its main feature – the Blue Circle is the perfect counterpoint to the Red Square. 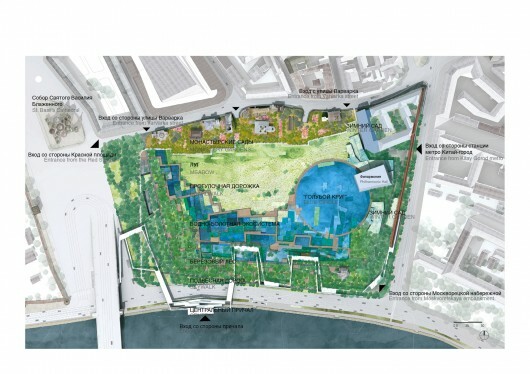 Zaryadye Park – the Blue Circle of Moscow – is an integration of 4 layers. Firstly, it is a system of Designed Natures. It is composed of 5 major landscape elements that represent Russian vernacular landscapes – them being, the monastery gardens, meadow, constructed wetland, reflection pond and birch forest. Secondly, the scheme brings to the fore the footprints remnants on the site. The design visualizes the imprints of the historical buildings and streetscape that lies underneath, and transforms these imprints into a functional wetland and ground pattern. Thirdly, there are the Winter gardens. Service facilities including café, restaurant, and temporary exhibitions are contained in glass houses. Lastly, there is the Boardwalk and Skywalk system that are detached from the ground and that integrate seating with platforms and environmental interpretation system for people to experience the designed natures.